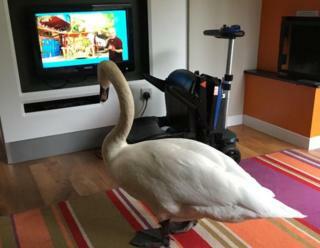 A woman was more than a little surprised when she found a swan in her holiday lodge - watching CBeebies on the television set. Dulcine Carney, from Norfolk, was on a short break with her nieces at Center Parcs in Sherwood Forest when one of the girls found the bird. "My niece whispered: 'Auntie, I need your help... with the swan'," she said. Miss Carney managed to usher the swan out. The photo she subsequently put on Twitter has been liked 56,000 times. "I'd just closed my eyes briefly when my niece whispered very quietly that she needed help," said Miss Carney. "When I asked with what, she said 'the swan'. "I opened my eyes and there it was sitting in the lounge watching children's TV. "His wife swan was waiting for him by the door." Miss Carney, a hospital occupational therapist from the Gorleston area, considered how best to get the bird outside and said: "I risk-assessed my arms versus its wings... and chose to get a duvet - but it didn't hiss or anything, and followed me in to the bedroom and followed me out. "Swans can break people's arms with their wings so I took that into consideration." However, she said the bird was "very friendly" and she even "patted it like a puppy" as she waved goodbye to it. "It was most surreal," she said. She posted a photo of the feathered interloper on Saturday. "A friend told me it had gone viral," Miss Carney said. More than 600 people have commented on Twitter and she has tens of thousands of "likes". "It's a photo of a swan watching CBeebies - what more can I say?" she added. A spokesman from Center Parcs said while they don't encourage visitors to feed the wild animals at their holiday villages, "our squirrels and swans tend to get quite comfortable around people".